You should be getting much more than that in return. Are You? Yes save 10% in addistion to the amount you save if you are also a member of PPAI. PPAF provides a list to SAGE on a quarterly basis of members. Double check your SAGE payment to see if you are receiving this discount. Being a PPAF member gets you business. How? When end buyers are looking for a reputable company to work with, many use the PPAF online directory. Please click here to see is your company information is correct. Only one listing per member company is available, however all your sales people can be listed. You can upload your logo, provide a company description etc. þ Are you attending the PPAF EXPO? PPAF members attend free. Mark your calendar for our 2014 show. Attending shows is more that seeing product. It is connecting with the suppliers who cover the region, attending education courses, and staying connected to the industry. If you and your staff are not attending, plan to do so in 2014. All PPAF Members will receive $10 to offset the cost of parking by bringing their parking receipt to the PPAF booth on the show floor. þ Are you using the PPAF Rewards Coupon to save money? 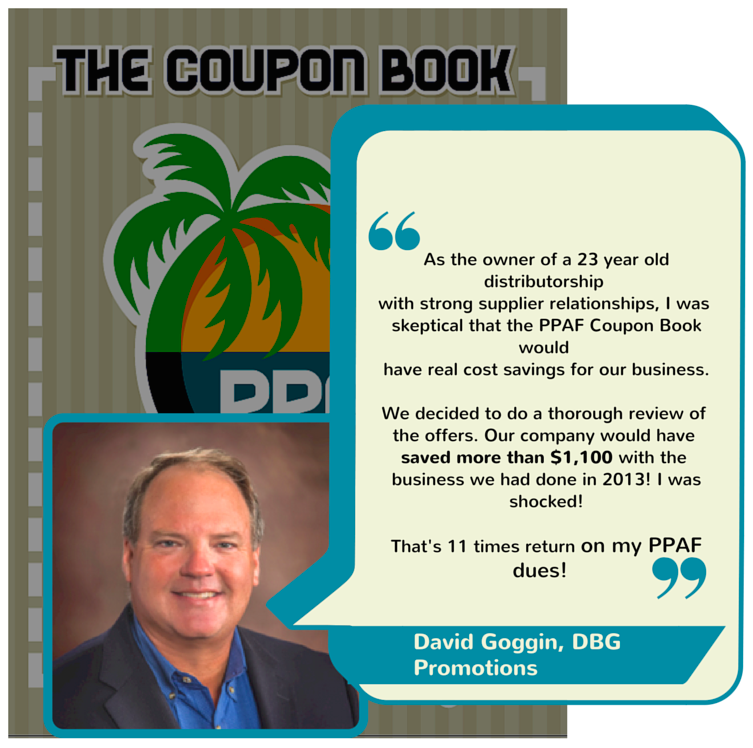 The PPAF Rewards Coupon Book is available to Distributor Members twice a year. (With up to $ 1500 in savings) This coupon book is available only to current PPAF members. Thank you to ZOOM Catalog for making this coupon book so easy to navigate. þ Are you using our events to work towards your MAS/CAS Certification? A major part of the mission of PPAF is professional development. PPAF offers seminars at our annual tradeshow,webinars and other opportunities to accrue points throughout the year. All of our professional development programs are certified for CEU points toward industry designations – TAS, CAS, MAS and MAS+. þ Did you know you can apply for an annual PPAF Scholarship and be awarded up to $1800 to use towards obtaining your TAS/CAS/MAS Certification? If you're pursuing your CAS, MAS or re-certification and need financial assistance, PPAF may have the answer. As strong supporters for education for its members, PPAF continues to offer scholarships annually. These are valued up tot $1800 each and will be awarded on the point system detailed on the application. The PPAF Expo is one of the premier regional tradeshows in the promotional products industry! Join us in Orlando, FL for two days of networking events, educational sessions, and one of the best shows during the fall selling season! With over 200 exhibitors and 600 distributor attendees, the PPAF Expo promises to be a sales-building show! þ Are you receiving our newsletter and e-updates? Enter your email below to be sure you are receiving our notifications. This in itself will save you money. This is where you see supplier specials, upcoming events (most free to members) and all the industry happenings in the region. If you aren't you should be. You can log into the PPAF website, find suppliers, see old newsletters, and access resources only available to members. If the PPAF website isn't bookmarked - it should be. It is shocking to see how important being connected can be. If you are not a member of our Facebook Page, please sign up to be. Join our LinkedIn Group, and follow us on Twitter. We often update members to happenings through these channels. Stay connected with us.